This post is sponsored by art.com. 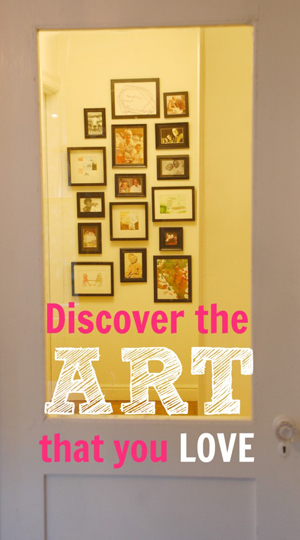 Do you love the art on your walls? There’s not one thing on my walls that I don’t love for one reason or another, and I’m a huge advocate of filling our homes with the things that make us happy, move us spiritually, or make us think. We have this dark, little hallway that was begging for something at the end of it. I had all sorts of ideas, but ultimately needed a place to store a collection of favorite family photos and small pieces of art. After pulling a sea of black frames together, I now have a happy collection that includes my smiling grandparents, mother-in-law as a 2-year-old, and my faraway niece and nephew mixed in with art that I love. Art has this power to transport us to another time or place, make us smile, change a mood, or get us back on track. An artist gave me this piece because I loved it so much. Gave. It. To. Me. Artists are like that. The wash line and tile roofs in this sweet watercolor garden scene remind me of where I grew up and of the first neighborhood my husband and I dug our heels into in Silver Lake (Los Angeles), which, by the way, was just named America’s Hippest Hipster Neighborhood in Forbes. It’s a cool spot of interestingness that I miss terribly. The Mission in SF and Williamsburg in Brooklyn came in next, in case you’re wondering. 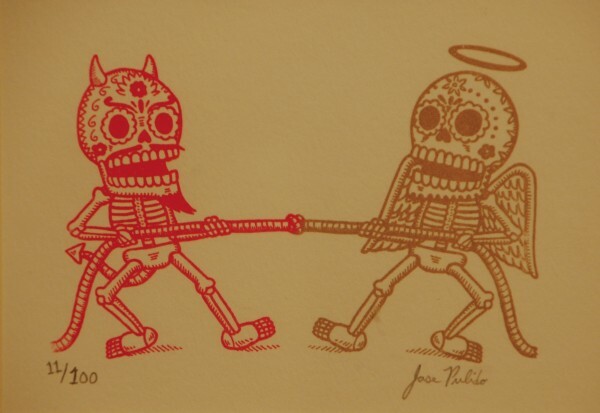 I found this funny piece by Jose Pulido on Etsy, and immediately fell in love with these little devils in a battle between good and evil. The skeleton, or Calavera, imagery is everywhere here in California, and this piece makes me think of my mom whose home is filled with Mexican art. It also reminds me of my roots in printmaking. It’s an original print. See the 11/100 on the left? That means that this was the 11th print he pulled in a series of 100. And after that, there will be no more prints. Some artists scratch the plate out once the last print has been pulled, but I have never been able to bring myself to do that. I found this upcycled art book at a gallery in Crockett, CA, right around the corner from my sister’s college. The artist turned old library cards into small, nostalgic paintings. The way she artfully repurposed these antiquated cards remind me of my own desire to upcycle and repurpose whenever I can. This piece is not an original, but it really doesn’t matter because I love looking at it. 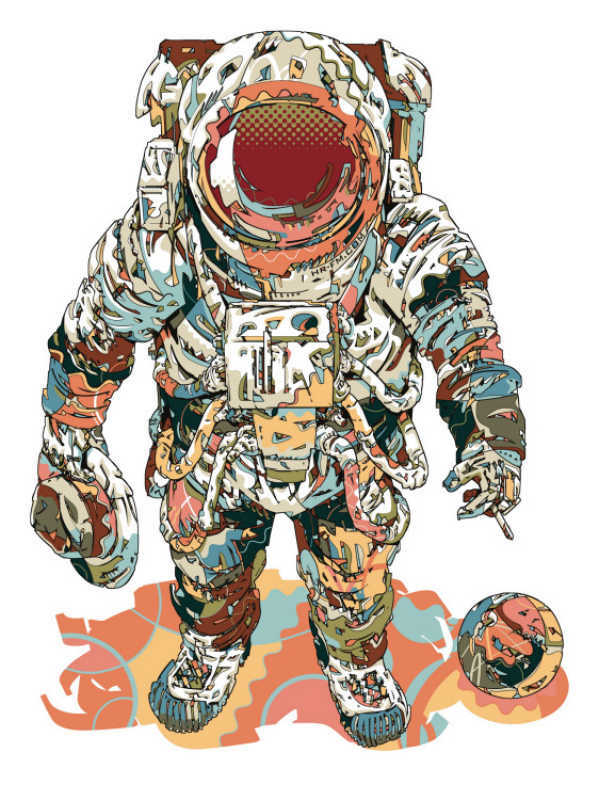 If you’re rounding out a developing collection of art or just starting out, consider visiting Art.com for its huge selection of images. I’m actually floored by all the thing you can find there. One of my favorite ways to search art.com is by subject. 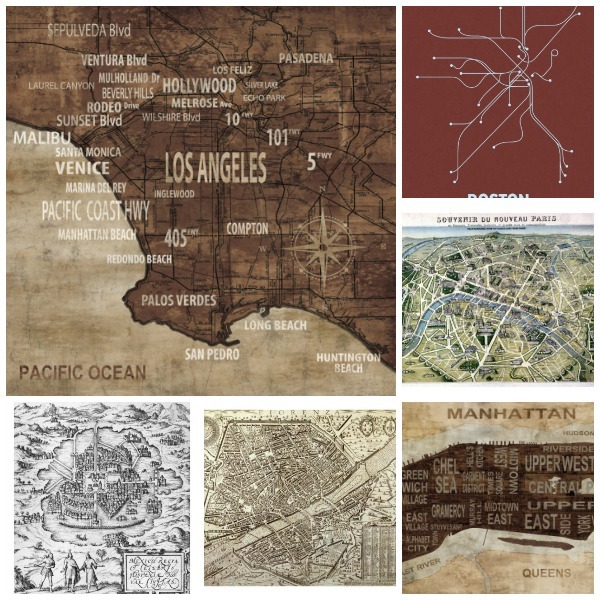 I happen to adore maps and after a couple clicks I landed on 100’s of city maps. Not exactly what you’d expect from art.com, right? I’m eyeing that Los Angeles map up there (no big surprise, right?). In case you’re wondering where Silverlake is located, you can spot it just above the “S” in Los Angeles. Working with Art.com to help them launch their new site has been such a joy for me. The quantity and diversity of the images on their site is mind-boggling, and having yet another excuse to share my art with you has been fun. 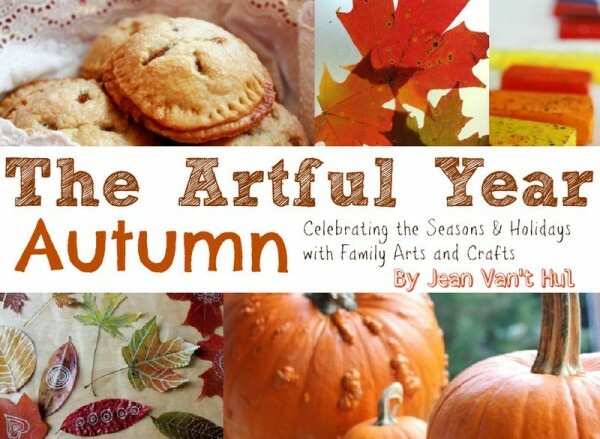 My friend Jean Van’t Hul of The Artful Parent releases her gorgeous new eBook today, The Artful Year: Autumn, the first of a new series of seasonal eBooks under The Artful Parent brand. If you don’t already follow her blog, it’s one of my favorites, and one of the reasons I’m blogging today. I had the pleasure of taking a sneak peek at the results of her hard work, and I can honestly say that if you enjoy celebrating the seasons with your family, you’ll be inspired by every last bit of this book. As you know, I’m a super hands-on, crafty parent, and this book is filled with lots of new-to-me ideas that are getting me excited to whip out a batch of pumpkin pie spice mix (recipe included in the book) and make a batch of Jack-O’-Lantern Playdough (recipe included for this as well). Um, our playdough smells like candy canes, so we’re definitely in need of a seasonal facelift. 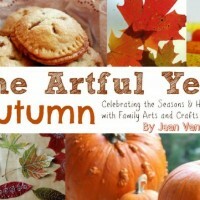 The 78-page book includes 17 Autumn Leaf Crafts, 15 Halloween crafts, 7 Autumn Recipes, and 5 Thanksgiving Projects. It’s full of clear, beautiful photographs and the instructions for each of the projects are easy to understand and well-researched. Coffee Filter Spiderwebs. Just like snowflakes — this is genius! 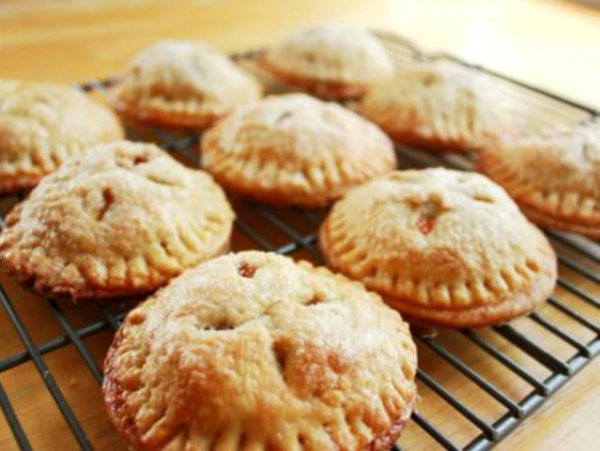 Apple-Cheddar Hand Pies. I’m a fan of apple pie, and have always wanted to make one with cheddar cheese — super excited about this one. Not to mention the on-the-go, individual quality of hand pies. Love this! 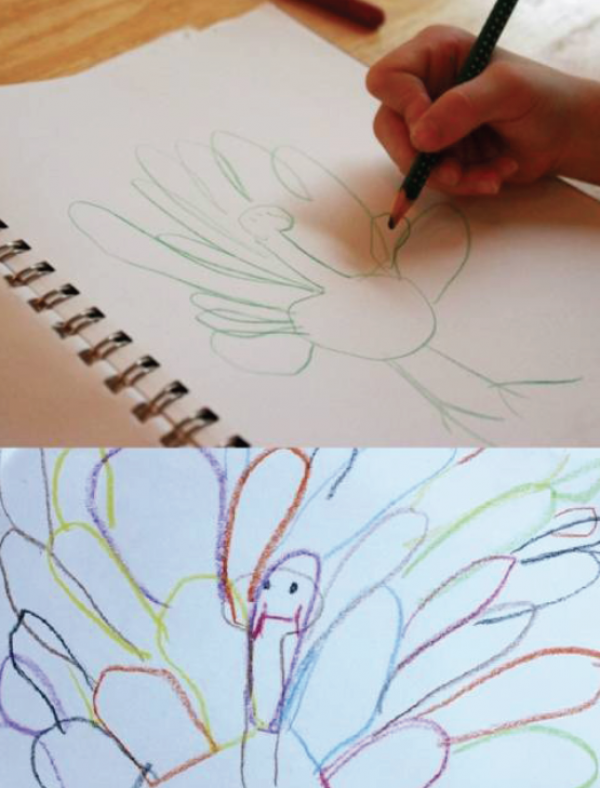 And one of my “art vs. craft” favorites: Not-a-hand Turkeys, where Jean gives some tips on how to draw a turkey from observation, moving children away from the rote hand turkeys we’ve all made. The book is beautifully organized, and I hope you’ll enjoy it as much as I do. If you’d like to order your own copy for just $9.99, click here to visit Jean Vant Hul. Just think, if you did each of the the 40+ activities in this book, that’s just 25 cents/project. Tinkerlab shares affiliate links for products we adore and/or think you’ll find useful. If you purchase through those links we’ll receive a small percentage of the sale, which help keep our inspiration-engine running. Thanks for your support! This post is sponsored by Art.com. Love your space more. This is the first of two posts on how I fill my space with art. I love having art in my home. How about you? Milestone pieces by my children, brilliant bursts of creativity from my artsy friends, and carefully selected pieces by inspiring artists energize me as I move through my day. 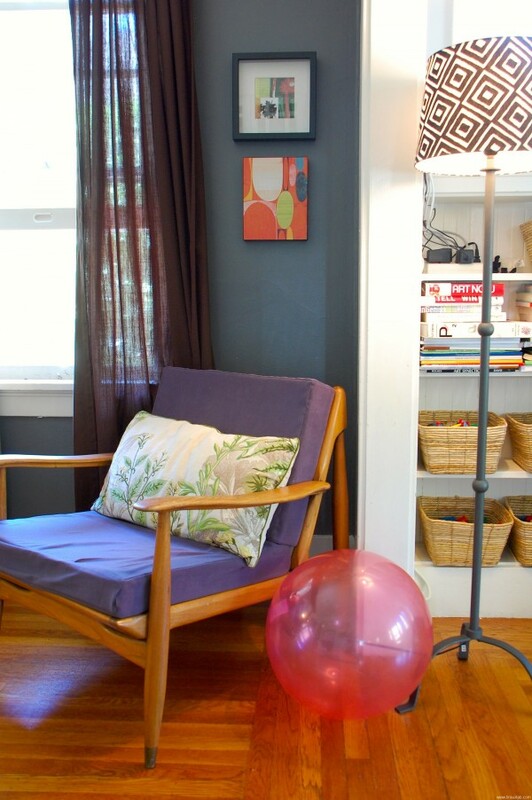 My home is filled a mix of my family’s art, art by my friends, and purchased pieces, but I do have the personal challenge of fitting all the things I love into our small cottage. To keep our space light, I try to limit what I show, group small pieces together, and only display what I love. I’m attracted to work that’s upcycled, illustrative, graffiti-covered, and kid-made. Where does your art come from? And what inspires your choices? When I choose pieces for my walls, I try to answer two questions: Do I love it? How does it balance or effect the room? If I answer “yes” to the first question, then I look around the house for the best place to display it. I don’t show the “background” of my home here very often, and look forward to taking you on a little tour of my art-filled spaces. Today I’ll start with some of living areas. If you like what you see, be sure to come back tomorrow for more. 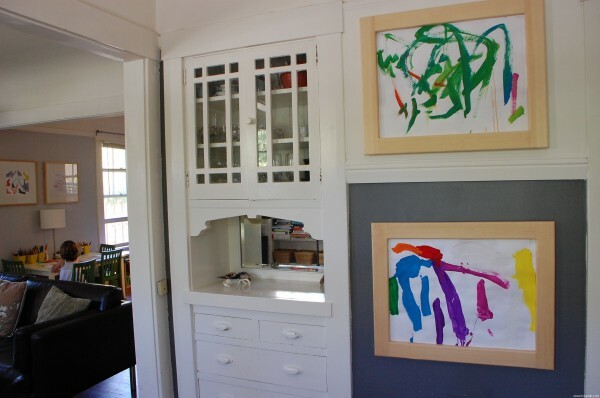 First, the kids’ art area. This table has moved around the house numerous times, but I really like it in its current spot. There are two kid-made pieces above the table: a watercolor painting by my older daughter and the first drawing made by my younger daughter. The frames are from IKEA — high quality and very easy to use. 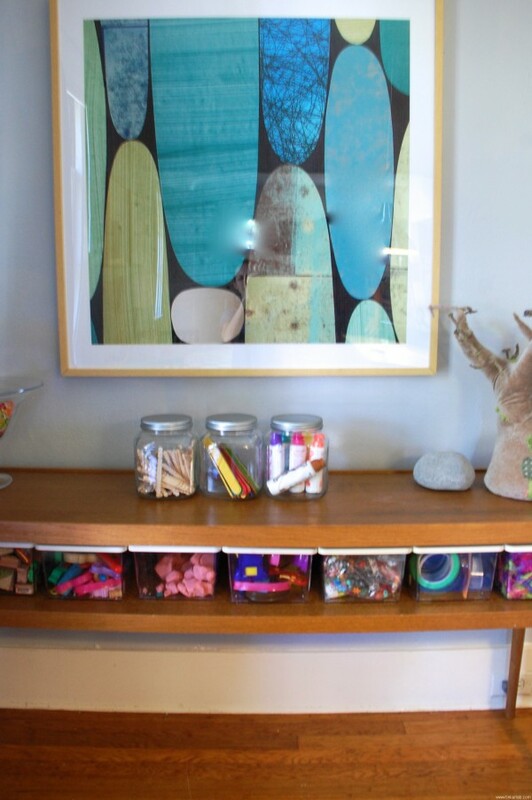 Next to the kids’ art table is my newest piece, a print of a Rex Ray collage, Agua Fresca, from Art.com. Art.com has an amazing collection of traditional and contemporary art, and I was thrilled to discover that they have multiple choices by Rex Ray, one of my favorite local artists. I usually prefer owning original works of art because I like to see the brush strokes and rawness of real art, but Rex Ray is waaaaaay out of my budget and this print enables me to bring a favorite artist into my home. It also looks great and Art.com did an amazing job framing it and shipping it without a scratch. I chose the frame to compliment the previous two, and they tie together beautifully. 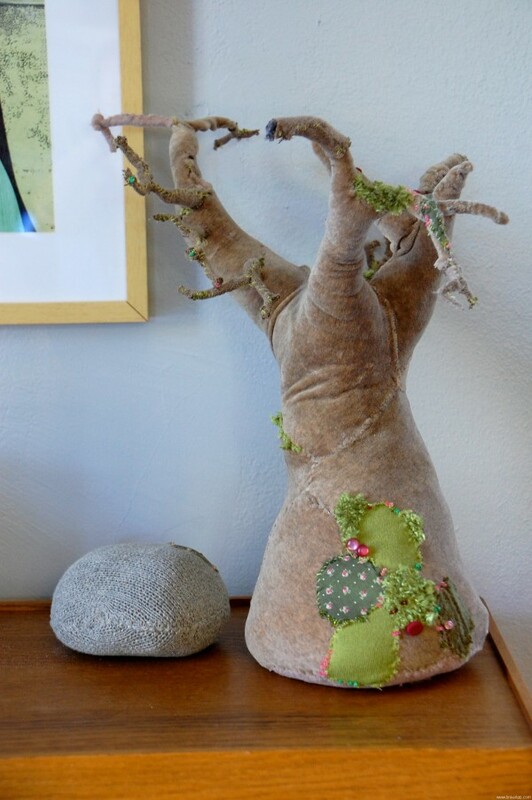 Below the Rex Ray is one of our recycled textile trees by San Francisco artist, Suzanne Husky. I own three of them (how could I stop at one? 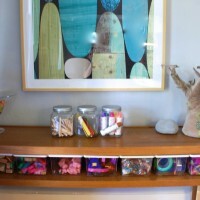 ), and I’m inspired by their resourcefulness and whimsy. Click on this installation of Suzanne’s these trees at the de Young Museum. 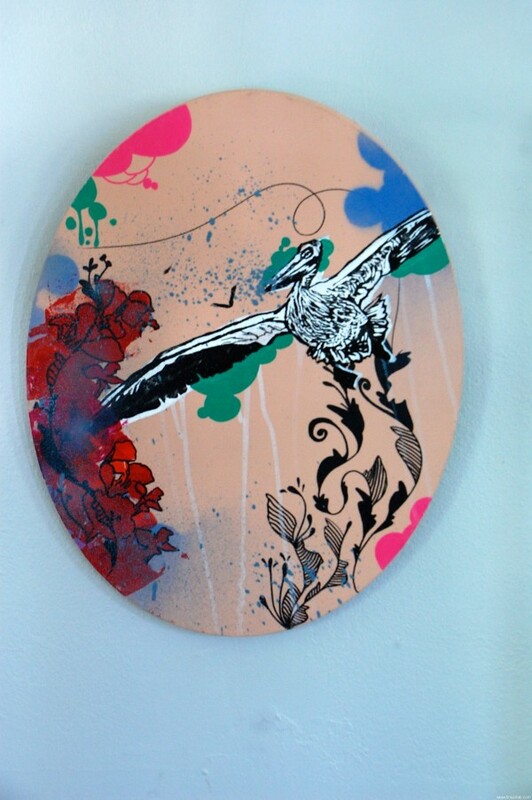 Across from the art table is this grafitti-inspired mixed media painting is by my friends Gwen and Joey Reyes. 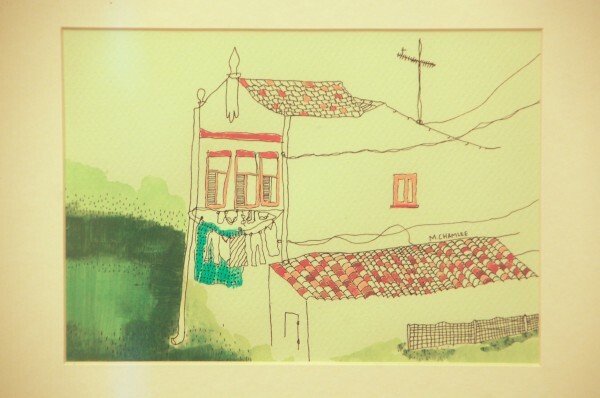 I worked with Gwen at the San Jose Museum of Art, and her work reminds me of Los Angeles, my childhood home. My girls make a lot of art in preschool, and the school smartly sells these useful frames that have a slot in the back that can hold up to ten paintings. I like the raw wood, but I’m thinking about painting the frames white or staining them. What do you think? Across from the preschool frames are these two pieces: I made the collage on top and beneath it is a Rex Ray stretched canvas print, Acapulco One, from Art.com. (I love this mid-century chair, but it’s desperate for new upholstery — any suggestions?). What’s on the walls of your home? Do you have trouble picking pieces or does it come naturally to you? This post is for all the parents who struggle to set up enriching hands-on projects for their kids, grandparents on the search for a unique gift for their grandkids, and anyone who wants to donate hands-on fun to children with pediatric diseases. For one week only, Tinkerlab is teaming up with the hands-on project company, Kiwi Crate, and eleven kid-friendly blogs to give you the opportunity to sign up for a Kiwi Crate subscription while also helping a child in need. 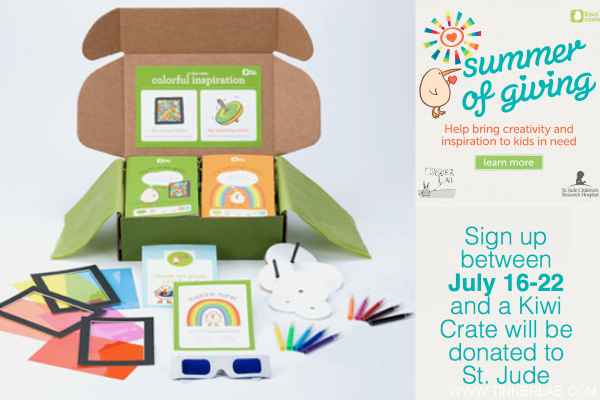 For every crate subscription purchased through my link this week (June 16 – 22, 2012), Kiwi Crate will donate a crate to St. Jude Children’s Research Hospital. Why St. Jude? St. Jude is a non-profit that puts saving the lives of children at its core. With our support, St. Jude can provide families with everything they need to get them through hard times as their children face the unthinkable. One of the most amazing things about St. Jude is that they freely share the research and learning in their hospitals to help save the lives of children around the world. This summer, Kiwi Crate is committed to giving back to the community by reaching out to children who might not normally have access to fun and enriching crafts and activities. So they reached out to me and a few of their favorite bloggers and charities to launch the Summer of Giving. 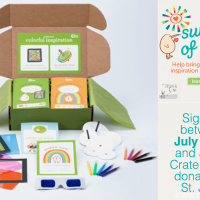 During this program, for each new subscription ordered, Kiwi Crate will donate one crate full of arts, crafts, and science activities to St. Jude. Kiwi Crate is a suscription service that delivers a beautifully packaged thematic crate of hands-on projects to your home each month. In each box are 2-3 carefully designed and kid-tested projects, which cover a range of developmental areas and subjects, including art, science, and imaginative play. All the materials and inspiration to encourage creativity and curiosity are included – you just supply the kid! The materials are high quality, the learning packets are painstakingly assembled, and every review I’ve read about Kiwi Crate (including my own) has been outstanding. Our goal is to donate 100 crates to St. Judes. Will you help us? If you’ve ever wanted to try out Kiwi Crate, now is a great time to give it a spin. YOU get a crate and a child who’s facing a terrible illness gets a crate too. Win – Win. Note: I’ve been an advisor to Kiwi Crate since May 2011, but I have not been compensated for this post. I’m excited to share that I have a brand new partnership with the popular art-shopping- hub-o-the-web, Art.com. Art.com *just* launched a radically new website designed to offer easy access to the world’s largest selection of handpicked art images. If you’ve ever been to the site before, definitely pay it another visit — it’s a whole new experience. 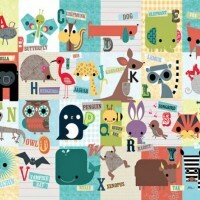 Very cool, lovely eye candy, and easy to use. Isn’t this cute? You can find it, and other preschool-related happiness, in the preschool category on their site. This new Art.com is filled with original content featuring art and design inspiration, curated collections by designers and tastemakers, social and sharing features and great new tools to help people find the art they love so they can love their space more. What kind of art do you like? We all have different tastes in art, and mine leans toward whimsy, irreverence, and abstraction. The old Art.com site was a great spot to find the traditional art (still is! 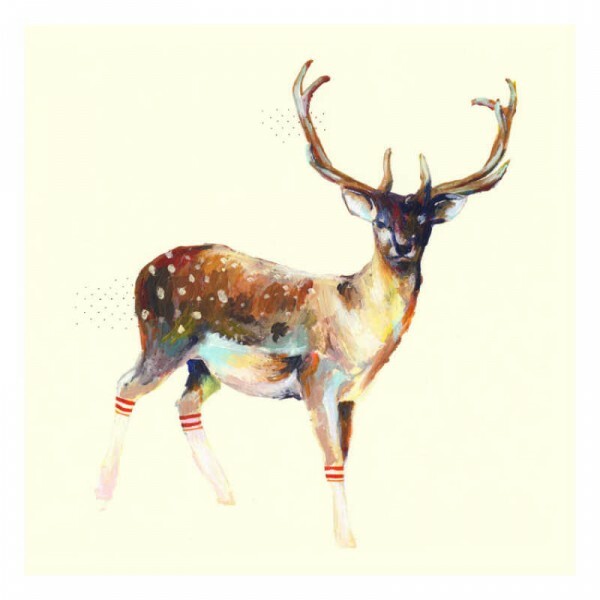 ), so I was delighted to find some quirky surprises like this knee-high wearing deer. Isn’t he funny? I started a public gallery on the site called Happy Go Lightly where you can see more of my whimsical curated picks, including those I’m featuring here . I was invited to choose one piece of art from the collection for my home, and the decision was so hard. Our house is tiny and most of our walls are already full of art, but there’s one spot in our dining area that is begging for something fresh. When I found a whole series of mixed media collage prints by San Francisco artist, Rex Ray, I knew I had to choose one for this spot. I first fell in love with Ray’s work at Michael Martin Gallery in San Francisco and have since seen it all over town at The Slanted Door restaurant in the Ferry Building, Rosewood Hotel in Menlo Park, and Gallery 16. 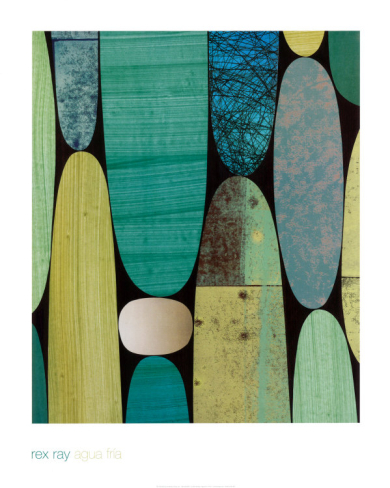 What attracts me to Ray’s work is his use of layered paint, textures, and color. The room is currently swimming in blues and greens, and I think this will bring it all together. All this talk about hanging art reminds me that I have a Pinterest board called “I Heart Art.” If your taste aligns at all with mine, you’ll probably dig some of my selections over there too. Art.com put this great video together that you’ll want to watch. What kind of art do you love? Is there a spot in your home that’s begging for a piece of art? Where is it? Hey friends…Guess what? I’ve been asked to partner with the well-loved toy company, Melissa & Doug, as an Honor Counselor during their virtual summer camp, Camp Sunny Patch. How fun! I’m a fan of M&D and I get to put my camp counselor skills to work (no surprise that I was once a camp counselor, is there?). 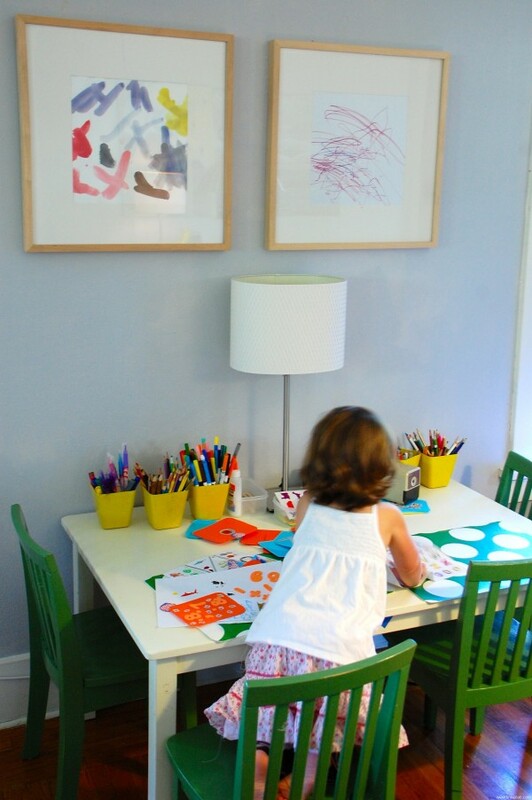 Does Melissa and Doug play as big role in your home as it does in mine? In our little corner of the world, we love Melissa & Doug for their wooden play food , numerous wooden puzzles , Wooden Take Along Tool Kit, stamp sets , and sticker books . Soooo, I’m obviously delighted to have the chance to bring this super-duper company in front of you, my readers. At the beginning of each summer month (June, July, and August) Melissa & Doug will post a calendar of easy-to-implement activities that you can do in your own home or backyard. Here’s the June calendar that’s already underway. If you save corks or know someone who does, this week’s Camp Counselor Allie from No Time for Flashcards is leading us in a cuddly animal-cork craft. You can follow the complete Camp Sunny Patch Guide here. To participate in any of the activities, you can easily download and print the month’s calendar and your child can earn badges for completing each project. 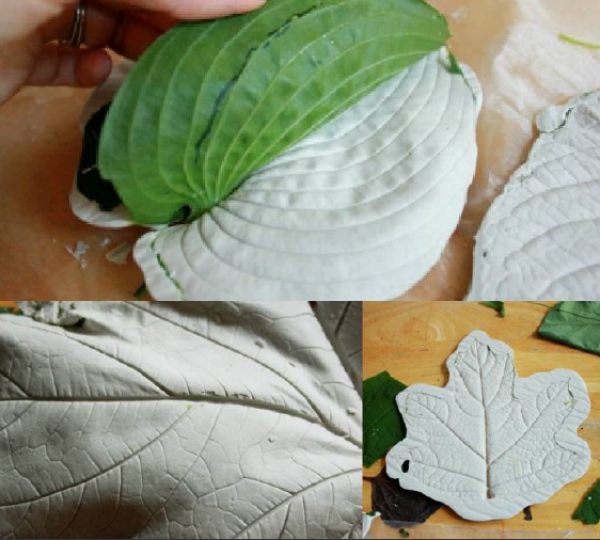 The projects range from crafts to high energy play, they don’t require a lot of materials, and they aren’t difficult to implement. You can download weekly play activities, camp badges, and more at blog.melissaanddoug.com. It’s summer camp, but without all the extra costs and it’s right in your own home or backyard. 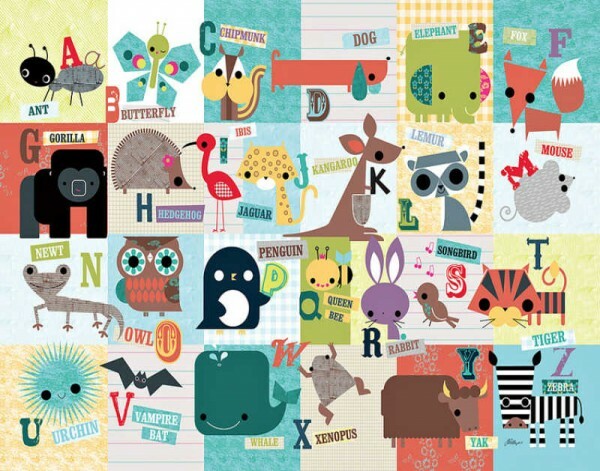 If you’re a fan of Melissa and Doug products and you don’t want to miss out on the latest M&D news, you can also sign up for their newsletter. Keep your eyes open for some summer camp fun from me in the next few weeks. Note: Tinkerlab is compensated for participating in the Camp Sunny Patch program. All ideas and opinions in this post are my own. Thanks for understanding that this helps keep this blog running!